Customized Mini Banner Stylus. 3 in one. Capcitive stylus + retractable scroll out banner + high quality mini ballpoint pen. 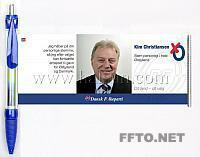 Full color offset printed on bothsides up to 38MM X100MM. Free shipping to USA, West Euro, Australia. Delivery time: about 4 weeks. 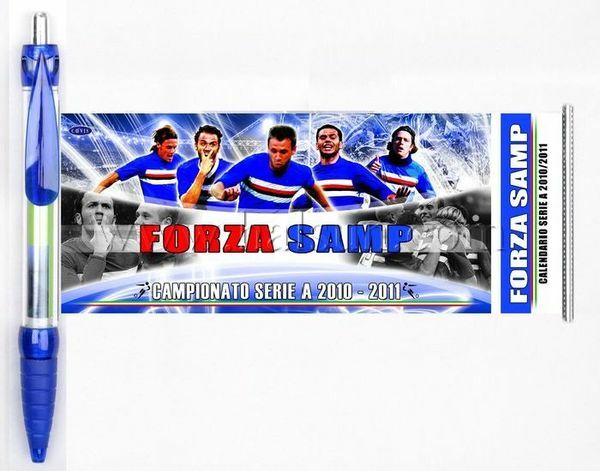 Mini Banner Stylus is an advertising pens, which can pull the 4 color offset printed flag out to see more details of the sponsor’s informations. The touchscreen stylus flag pen Contain a touchscreen stylus, ballpoint pen, and a retractable custom printed flag sized up to 3.8MM X100MM max! These Promotional Mini Banner Styluses are Unique New Concept! Impact your clients with your such rich and exquisite billboard well scrolled inside a common ballpoint. The mini touchscreen stylus flag pen is perfect for iphone, Android phones, ipad, tablets and any devices with a touchscreen made of capacitor panel. Mini Banner Stylus is the latest innovative promotional gifts that are both functional and informative. They are used as corporate printed pens, trade show give aways, promotional product items, charity products, business items or a unique business card. Those Mini Banner Stylusss have immediate impact. The promotional products buyer is always looking for a new standout concept that will really grab people’s attention. The brochure pen has just hit the market and new adopters are extremely happy with the response from clients, prospects and members. Unlike traditional giveaways that people swiftly forget about, these promotional Mini Banner Stylus are something that will keep on selling, informing and educating your prospects for months. Importantly these Mini Banner Stylus are inexpensive option compared to many other promotional pens. So often companies spend money on giveaways that have no useful application. 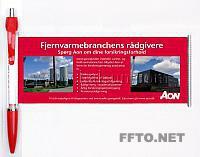 The Promotional Brochure Pen is a product that will give you a good return on your promotional dollars. When marketing budgets are tight these pens, at around one dollar, are excellent value. 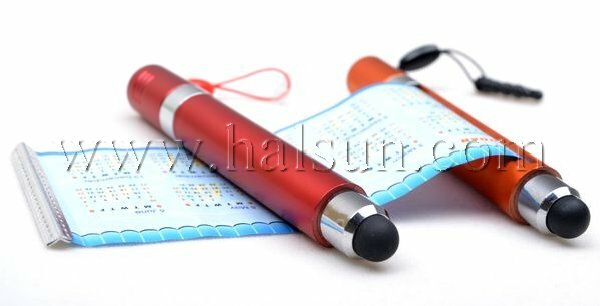 We HALSUN have been professional Chinese manufacturer and direct seller of banner pens for years. We’ve helped many companies to enhance their promotional program, distinguishing political candidates by giving away this unique and useful banner pens to public. Now we’ve lunched this new touch screen mini banner stylus for the market of rapid growing users of smart phones and other capcitive touch screen mobile devices. Supplement your promotional programs with the perfect trade show promotional giveaway — touch screen stylus mini banner pens! Impact your clients with your such rich and exquisite billboard well scrolled inside a common mini stylus. The capcative touchscreen mini banner stylus is perfect for iphone, Android phones, ipad, tablets and any devices with a touchscreen made of capacitor panel. Mini touchscreen stylus, suitable for iphone, ipad, android phone, windows 8 phone, android tablets, and any devies with a touchscren made of capacitor panel. .
With 3.5mm Adapter Plug for for Kindle Fire, Touch, Motorola Xoom Android, Samsung Galaxy Tab 7inch, 10.1 inch, HP TouchPad, Vizio 8-inch wifi, Asus Eee Pad Transformer, Apple iPad, Acer Iconia Tab A500, W500, Blackberry Playbook, Toshiba Thrive, Skytex Skypad Alpha, Dell Strak 7, Viewsonic gTablet, Lenovo K1 Ideapad, Coby Kyros 8-inch Tablet,Sony PS Vita . High quality printed promotional pen with a long life cartridge to prolong the pens useful life. Full colour printing on both sides of the brochure give a selling and branding opportunity then other printed pens cant match. The cost of the printed mini banner stylus makes a very affordable business item / giveaway . Large quantity buying attracts super competitive pricing. Colour matching of pens to your corporate colours makes it a fantastic business item. Keep your screen free from fingerprints and smudges, Prevent Scratches, bumps, grease and finger prints on the screen. We are professional promotional gifts supplier, you can see some of our Mini Banner Stylus reference clients. . This entry was posted in Uncategorized and tagged android phone stylus touch banner pens, banner stylus, flag stylus, iphone stlylus touch banner pens, iphone stylus pens, mini banner stylus, Mini Capacitive Touch Screen Stylus Pen for Apple iPhone iPad iTouch, Mini Flag Stylus, mini scroll stylus, mini stylus banner pens, Mini Stylus Flag Pens, mini stylus scroll pens, mini stylus touch banner pens, Mini Stylus Touch Flag Pens, mini stylus touch pull out pens, mini stylus touch scroll pens, Mini Touchscreen Stylus banner Pen, Mini Touchscreen Stylus Flag Pen, Mini Touchscreen Stylus Pen, Mini Touchscreen Stylus scroll Pen, scroll stylus, stylus banner pens, stylus flag pens, stylus pull out pens, stylus scroll pens, stylus touch banner pens, stylus touch flag pens, stylus touch pull put pens, stylus touch scroll pens. Bookmark the permalink.